Do You Want a Personal Relationship with Jesus? 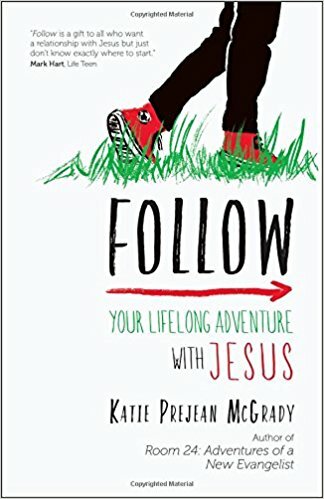 Follow: Your Lifelong Adventure with Jesus is the answer to that young man’s question. It is designed for those who have some familiarity with the Catholic faith, perhaps have even been practicing it their whole lives, but who, for whatever reason, haven’t made it their own. She offers a “process of meeting and falling in love with the Savior of the World” which is set firmly within the Catholic tradition. How do you meet Jesus? The answer is through prayer, Scripture, and the Sacraments. Once we meet Jesus, we are then called to share Jesus by “being Jesus to others.” We encounter Jesus and then we are invited to live out that faith and relationship by serving those around us on a daily basis. It is a lifelong journey. Interwoven in the text, McGrady shares her own story of coming to have a deep relationship with Jesus and how he has worked in her life. The way God arranged for her to meet her husband is positively amazing. Follow is written in an easy-to-understand conversational style, but the theology is solid and there is a great deal of good advice in these pages. It is designed for high school and college age individuals, however the suggestions McGrady offers can be used by those of any age. Are you a Catholic homeschooler? Would you like to share your hard-earned wisdom with other homeschoolers? 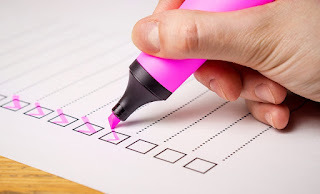 I'm conducting a survey on Catholic homeschooling for my Today's Catholic Homeschooling website and I would love to have as many Catholic homeschoolers take part as possible. I will use the responses in articles, and possibly a book, to help Catholic homeschoolers in their lives. And thank you so much for your time! Please feel free to share the survey link with other Catholic Homeschoolers. Caitlyn Summer had always followed the straight and narrow path. Her perfect husband would love Jesus more than her and love her because of her love for Jesus. He would be faithful and gentle and have a heart for others. So how did she end up marrying the bad boy who got her high school best friend pregnant then pressured her to abort? ​Unable to remember the past three years or understand why she would’ve moved so far from home, Caitlyn can’t believe she willingly married such an overprotective, bossy, and jealous man. In this emotionally-charged, new adult mystery romance, ANYONE BUT HIM, Caitlyn struggles to solve the mysteries of her amnesia and her marriage. Suspicious circumstances surrounding her husband tempt her to leave and start life over, but they also challenge her Christian faith and convictions. The arrival of her first love, her husband's younger brother, intent on helping her regain her memory, offers a glimmer of hope. Together they uncover secrets involving her coworkers and the local abortion clinic, but nothing to explain why she married this man. Who changed – him or her? Theresa Linden is the author of award-winning Catholic teen fiction. Raised in a military family, she developed a strong patriotism and a sense of adventure. Her Catholic faith inspires the belief that there is no greater adventure than the reality we can’t see, the spiritual side of life. She has six published novels, and two short stories in Image and Likeness: Literary Reflections on the Theology of the Body (Full Quiver Publishing). She holds a Catechetical Diploma from Catholic Distance University and is a member of the Catholic Writers Guild and the International Writers Society. A wife, homeschooling mom, and Secular Franciscan, she resides in northeast Ohio with her husband and three teenage boys. Anyone but Him is told entirely from Caitlyn Summer’s perspective. What is Caitlyn like? Caitlyn is one of the characters in my West Brothers young adult series, but she is all grown up in this new adult story. She is a faithful Christian who loves her life and her family, and she’s always been full of bubbly hope. She doesn’t swear, never did drugs, and she had always intended to save herself for marriage. In this story, she wakes up in a nightmare situation, and she just can’t come to terms with it. She is miles from home and she is married to a boy she never even liked in high school. He’s vain and egocentric. And he’s always had drastically lower standards than her. And because she’s always romanticized her future, knowing what kind of man she would one day marry, she can’t believe this is her life. Action scenes takes place in woods that seem unfamiliar to Caitlyn. And another scene takes place on the beach. What made you choose North Carolina for the location in this story? For the story to work, I needed a location that was far away from where Caitlyn grew up, in South Dakota. As a young woman, I spent one summer in North Carolina with friends. I loved the beauty and diversity of the landscape, with forests and beaches and orange dirt. And I enjoyed the relaxed pace and listening to the southern accents. So North Carolina seemed like a perfect fit for this story! What makes this mystery romance different? Well, at first it doesn’t seem like this story will have a detective, but it does. And while all mysteries have elements which remain unknown or unexplained until the end, this story has more than a few elements. For one, Caitlyn wakes with amnesia. She has no idea what caused the amnesia and no one else seems to know either. The even bigger problem for her is this man she wakes up next to. He claims to be her husband, but she can’t imagine how she would’ve married a man like him. The stakes are raised when her husband’s younger brother arrives on the scene. She remembers being in love with him. Why hadn’t she married him? Throughout this story, while trying to solve these mysteries, Caitlyn finds herself evaluating her faith and her understanding of what marriage truly is. While trying to understand how she ended up married to him, Caitlyn’s most important question becomes “Who changed?” Has she discarded the values she cherished or has her husband become the kind of man she dreamed of? What lesson is there for all of us in how we see each other, particularly those we’ve known a long time? Sometimes it is easier to overlook faults in a stranger than in one who is close to us. It can be easier to offer kindness and mercy to a stranger as well. We see our loved ones’ strengths and weaknesses day after day. We expect them to act a certain way in various situations. So it can be difficult to recognize when someone we think we know so well has changed for the better. We too often jump to conclusions based on a person’s past behavior. I suppose this is because we have a vested interest in our family members. We feel responsible for them and want to help them become better people. But it’s important that we recognize the work of God in their lives as well. What do you most want readers to take away from Anyone But Him? We’ve all made mistakes and sometimes very big ones, but God is bigger than our mistakes and He can lift us up and set us on a new and beautiful path. I hope this story offers hope and encouragement. You’ve written discussion guides for your other books. What extras do you have planned for this one? This book will also have a book club discussion guide and discounts for bulk purchases. Visit my website for details. I also plan to share the recipes of the food that characters prepare throughout the story, including Chicken Florentine, apple crepes, and authentic Mexican tamales. I’ll share these recipes on my blog and website. Oh, and readers will finally get to find out what Jarret put in the eggs, as mentioned in chapter 3. I am currently writing the next two books in the West Brothers series. The first one, Roland West, Outcast, is about a shy teen who fears speaking up, but when his best friend begs him to look into the vandalism of an outcast’s house, his detective skills may be the only way to find answers. The second one is a Confirmation story. I don’t have a working title or story blurb for that one yet, but I want it to really bring the grace of the Sacrament of Confirmation to life through the West brothers. St. Dymphna of Ireland, the patron saint of those suffering from mental illness, hears a lot from me. I ask for her intercession daily both for myself and for several people I care about. 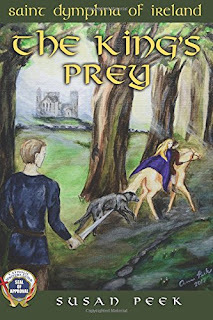 For this reason, I was excited to read The King’s Prey, a fictional telling of her life story by Susan Peek. Very little is known about the real-life St. Dymphna. She was an Irish princess who had taken a vow of chastity as a young teenager. When her mother died, her father became mentally ill and started pursuing Dymphna, wanting her to become his wife in place of her mother. Dymphna ran away with the help of Father Gerebernas and the “king’s fool,” but the king was ultimately able to hunt her down and martyred her. Peek has taken the bones of this story and expanded upon them greatly. The “king’s fool” has been transformed into Briocc, a harpist, who suffers from post-traumatic stress disorder due to his family’s death, being abandoned by his brother, and a wolf attack when he was young. Peek’s realistic description of this young man suffering from mental illness is skillfully portrayed. His older brother, Turlough (the one who had abandoned him because he couldn’t take care of him) is one of the king’s soldiers. The tension between the two brothers adds much to this story. Dymphna herself comes across as a real-life young woman, striving to be holy, but also simply trying to survive. The King’s Prey is a compelling adventure story which will appeal to both teens and adults. While Peek recommends the book for ages 16 and up due to the thematic material, I feel comfortable recommending it for any high school aged student.